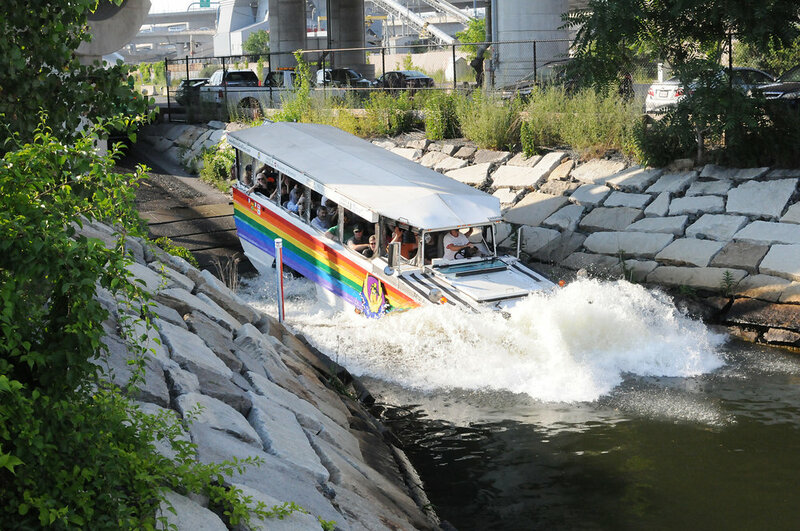 Hop aboard Boston’s most popular tour! Boston Duck Tours is a fully narrated, historic tour of Boston in a WWII style amphibious vehicle that travels on land and water. You’ll cruise by all the places that make Boston the birthplace of freedom and a city of firsts, Just when you think you’ve seen it all, your DUCK drives right into the Charles River for a breathtaking view of the Boston and Cambridge skylines. Hours: 9:00 AM until an hour before sunset, daily; First day of Spring until the Sunday after Thanksgiving. Min/Max size: Minimum 20; Special accommodations can be made for groups over 400 passengers. Group Rates: In addition to the listed rates below, ask our group reservations office about Special Fall Discounts available for student groups! Length of Visit: All tours are approximately an hour and 20 minutes in length. An hour on land and 20 minutes in the water. Tour times may vary from time to time due to traffic patterns and construction. Food: Boston Duck Tours offers partner packages with many group friendly restaurants and attractions. Gift Shop: There are merchandise carts at The Museum of Science and Prudential Center and a limited amount of merchandise available online and at the New England Aquarium. Accessibility: We have wheelchair accessible DUCKS from our Prudential Center and Museum of Science departure locations. If you are booking online you MUST call us at 617-450-0068 and tell us you have a guest that needs to stay in their wheelchair as we need to pull 3 extra seats to fit the wheelchair in the DUCK. CLICK HERE for more details. Parking Info: Tours depart from the Prudential Center, Museum of Science & New England Aquarium. There is paid car parking at all three locations. Bus parking may be found at the Prudential Center on Huntington Avenue, across from the Christian Science Plaza (limited parking). There is also bus parking near the Museum of Science & New England Aquarium at the Moran Terminal in Charlestown for a daily fee.